I wasn't quite sure what to expect from the show when it appeared as one of the featured shows on my Netflix account but it felt like something I'd like. Then friends started to rave about it and a few geeky celebrities also talked about the show and watching it became a much higher priority. There's a subtle loftiness to this show that really makes it feel special and at times sublime. And given its graphic novel origins the stories are fairly rich in terms of complexity versus most other animated shows and with a rather fascinating mythology that evolves over the course of this first season. I absolutely loved this show. 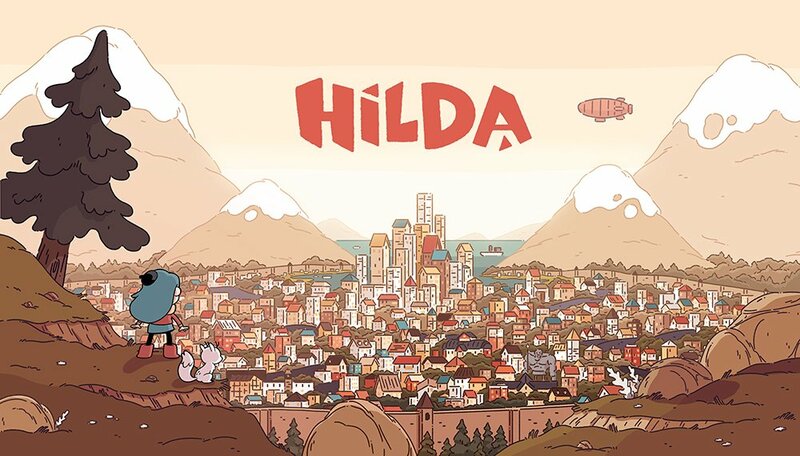 Synopsis: Hilda is a British-Canadian animated television series created by Luke Pearson, who had also created the graphic novel series of the same name that the show was based on. At the moment the show is a Netflix-exclusive. The titular character Hilda is a young blue-haired grow who starts the show living alone with her mother in a cozy house in the wilderness. Thus environment has helped her to grow up to be pretty strong and independent versus other girls her age and one not easily scared as she has instead focused on learning more about the creatures around her instead of being afraid of the unknown upfront. Her mother is keen on them moving to the nearby city of Trolberg, where she had grown up before. But of course Hilda is most at home in the wilderness with its strange creatures and potential dangers. But eventually they are going to move and everything will change for our little blue-haired friend. What I Liked: Hilda is such a likeable character and her bravery and willingness to drive into adventure really defines the show. But she's not a fighter - instead she has a genuine curiosity about new things and does her best to understand them and figure out what's causing this or that creature to wander around to behave outside of expected parameters. She's a bonafide hero for a new generation that is sure to empower children of different agents that we can be better. And the writing for this show is wonderfully tight as we have a very rich lore for this world that we are slowly introduced to with each episode. It starts a little episode with a freak of the week but over time those different creatures may stand a chance to come up again or play a role in later and things largely come together by the end of the season. And I know this sounds like many other shows but it's quite effectively here and the final result is practically magical. What Could Have Been Better: The story takes place in an indeterminate city that as much as it's meant to be largely fantasy in tone but .of course it also feels familiar since it's still a fairly modern city. And there's that somewhat illogical desire to associate the behavior with popular cities and when thing don't conform to that idea you start creating in your head and that can nag you a bit. And the stories are terribly short and every story is wrapped up by the end and you will feel the desire to pursue things further but you can't. And you'll really want to get to know some of these characters and creatures more but it's still an animated series primarily targeted at children and so things have to stop somewhere. TL;DR: Hilda is a beautiful series with a lovely hero at its center and an interesting cast of supporting characters and intriguing creatures. The approach feels both innocent and honest and yet also new and inspiring and just so many good feels all around. And thus the show gets a full 5 magical creatures hiding in plain sight out of a possible 5.